To celebrate the completion of Dollar General’s successful IPO, the company organized a dinner to both celebrate and honor the individuals who had been integral to the success of the launch. Due to a number of circumstances, the company needed the gifts to be produced and delivered in just 10 days. To celebrate the company’s history and people, from its founding to present day. To reflect the immediate and award-winning success of the IPO. To recognize the contributions of both Goldman-Sachs and KKR, who helped to facilitate the transaction. To find a designer who could achieve a quick turn-around. 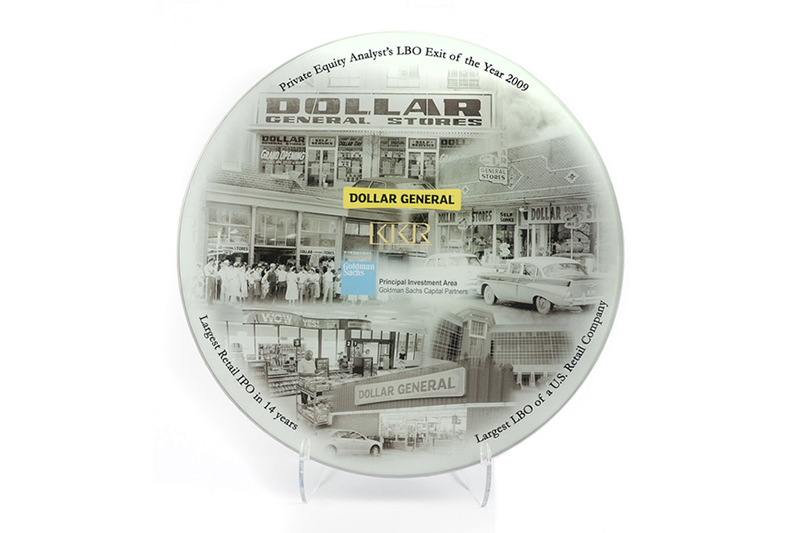 Upon the celebration of Dollar General’s successful IPO, attendees were presented with a découpage plate displaying a collage of images from the company archives. These photos commemorate the history of the company’s great accomplishments of the past 50 years. Around the rim of the plate are the IPO’s successes, achieving the the largest retail IPO in 14 years, the largest LBO of a US retail company, and Private Equity Analysts LBO Exit of the Year (2009). At the center of the plate, the logos of Dollar General, KKR, and Goldman-Sachs are proudly displayed together.